What does a penguin look like? for the sea lions, leopard seals and other predators to see its white underside. 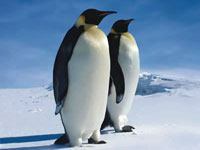 Penguins are found in the cold ocean waters in the Southern Hemisphere. They can be found in New Zealand, on the Galapagos Islands, as well as on other islands in the Southern Hemisphere. They can also be found on the continents of Africa, Australia and Antarctica. What does a penguin eat? 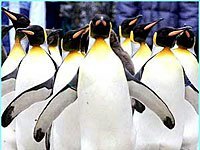 Penguins eat fish and krill. They don't drink water, but eat snow. They have a gland in their nose that takes the salt out of the ocean water. They swallow ocean water when they catch fish. Penguins are excellent swimmers. Their wings have evolved to form small paddles, which they use to swim through the water. 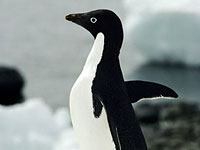 A penguin uses its webbed feet and stiff tail as a rudder. They can make porpoise like leaps from the water's surface. They can come ashore by walking onto protected beaches or by vaulting themselves out of the water onto land. Then they waddle erect, climb steep slopes, or toboggan on their bellies over the snow. No, penguins use their wings (called flippers) to propel themselves through water rather than air. Because water is much more dense than air, penguin wings are shorter and stouter than the wings of flying birds. 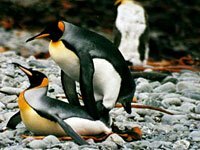 Penguins are also much heavier than similar sized flying birds and have solid bones rather than weight-saving air-filled bones. While these characteristics enable penguins to efficiently "fly" through water, they have had to sacrifice the ability to fly in air to do so. Did you know this about penguins? 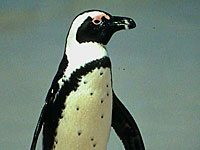 The penguin's black and white coat helps it avoid detection by predators. From below, its white belly is difficult to distinguish from the water's reflective surface; from above, the penguin's black back blends in with the murky depths below. 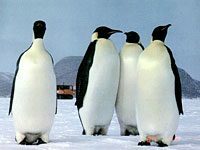 The largest penguin that ever lived, Nordenskjoeld's giant penguin, was about as tall as a person — nearly twice the height of today's emperor penguin. It lived 45-37 million years ago in New Zealand and Antarctica. 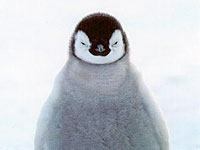 Not all penguins live in southern climates. The Galápagos penguin lives along the equator. It survives there because of cool temperatures and cool water brought to the islands by ocean currents. Download free Penguin wallpapers, click on the image to open the large version. Print free Penguin coloring pages, click on the image to open the large version.